Also known as the "rosy-headed cockatoo" or Rose-breasted Cockatoo in America. Its scientific name is Cacatua roseicapilla. Originally this bird resided in the arid dry interior but now mainly due to European settlement and their introduced ceral crops, the galah is found all over Australia in small and large flocks. 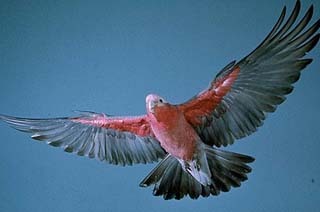 The galah is a grey and pink cockatoo, very active and noisy with a shrill call. Their faces have a pink eye ring and the difference between males and females is their eye colours. The mature females is a "coppery"red whilst the mature males is darker. As prevously stated they are found all over Australia from open plains ( grass or crops), to woodlands, shrubs and even suburban parks. Galahs are a seed feeding bird feeding on both native plant seeds, fruit & nut seeds as well asceral crops of wheat, oats etc, foraging for the seeds on the ground. They do on rare occasions also eat small insects. They will travel a fair distance from their "roost"in search of food. Farmers consider them a pest because of the damage they do to crops. Galahs stick together in flocks numbering up to a couple of hundred. They willl though in pairs leave the flock to nest. They are not in the main a territorial bird often sharing roosting trees with others. Breeding times vary upon their location but generally up North it is February to July, and down south from July to December. They nest in a tree cavity and produce on average 3 to 4 eggs which take about a month to incubate. Often the tree is marked by removing a patch of bark near the nest, thought to be a message to other galahs that that hollow is already being used. Both parents care for the young which "fledge" after 2 months. The youngs "down" (soft early small furry feathers) are pink.